There was that big End and then la Grande Silence but Mailhos is not dead! 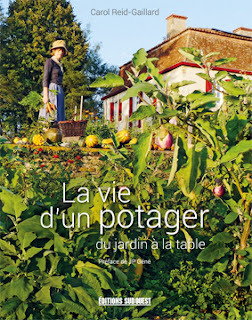 Firstly I have a book coming out this week in the gallic tongue but soon enough, I hope in English. The book weighs 590g and has 244 pages recounting the tale of Carol and Jean Francois trying to be farmers from the début in 2006 up to the serene year of 2011… with recipes, chickens and many daft stories. News is that Mailhos didn’t want us to leave and is missing us and as our work is unfinished, we are returning home to the Bearnaise countryside in the new year to continue our adventures. Right now the garden is a jungle of weeds and slugs where nature has taken our place both inside and outside. The swimming pool is a green sludge of happy frogs and salmanders while muscat grape vines and wasp nests have left me barely enough room to turn my head in the greenhouse. But its not too sad because there are so many happy birds and animals using Mailhos as a haven, especially during the forthcoming hunting season. So right now the caravan is on its travels and wearing out the husband so he will never want to leave our enchanted life for any long period again with a return in Spring to repair the damage of time and damage the repair our bones have undergone…. Pourriez vous me contacter par mail au sujet de votre travail de potagiste. I'm french (excuse me for my difficulties in your language). I just want congratulate you for your work, i'm reading your book and i finded excellent. Thank you and I think i will come here.